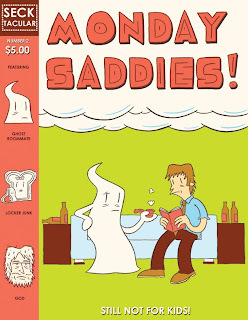 SPX Spotlight 2013: Steve Seck and Monday Saddies! I first found Steve Seck via Sara Lindo, and I'm glad I did, because both members of the cartooning couple are not only great creators but awesome people as well. While Sara tends to look at the brighter side of life, Steve revels in making comics about the worst sort of people--but at the same time, he's also able to make them very human. (Well, kinda. They tend to be animals, actually. Animals that act human.) They make mistakes and try to cover them up. They have drinking problems. They curse and litter and have some disturbing preferences. In other words, they're ordinary people. We know folks who do similar things, though not to the extremes that Seck presents to the reader, and that's part of why we're able to laugh--sometimes uncomfortably--at his characters. Monday Saddies! 2 is set to debut at SPX this year, and if issue one is any indication, readers who enjoy comics about characters making bad life choices are in for a treat. I've not had an opportunity to read issue 2 yet, but issue one was one of my favorite minis of 2012. In Monday Saddies!, Seck takes his general use of imperfect characters and ramps it up to 11. The first issue features a Yogi Bear-like set-up, though the real relationship is between Sweetie Snake and Ranger Bradley, with the Yogi analog only featuring to show how just how low the other two characters can stoop. Sweetie abuses his privileges and then moves on to abusing Ranger Bradley, who finds this isn't the worst setup in the world. Things accelerate, as they always do, and in the end--NO ONE LEARNS ANYTHING! It's awesome, and anyone who is a fan of Peter Bagge will want to grab this, as it's definitely in a similar style. Like Bagge, Seck captures the feeling in his art as well as his dialogue and plot. As you can see from the cover above, his work is sharp and jagged. The images jar the reader out of the "funny animal" comfort zone just as much as their actions do. Issue 2 features a whole new set of characters, but looks to be in the same vein as issue 1. Both will be available at SPX, as will Seck's Life is Good series, which merely features folks who are unpleasant. (Review of issues 6 and 7 here.) You can get Life is Good in singles or also as a trade paperback. In addition, Seck will also have a print of MST3K characters. Steve and Sara, like all quality people, are huge fans of the show, and this print plan of his sounds awesome and ambitious! Can't make SPX? Life is bad! But you can find out more about Life is Good and Steve's other comics by visiting his website, which also links to his store.